In a seminal paper  from 1958 Franco Modigliani and Merton H Miller showed why investors should not care about whether firms were financed with debt or equity. This led to the idea of the the debt irrelevance proposition and although the DIP is a theoretical benchmark rather than a real world rule the 1958 paper by Modigliani and Miller remains a key contribution to the finance literature. We should not however extend the same role to the recent attempt by researchers  to re-invent the DIP in a new guise replacing "debt" by "demographics". Allow me to explain why. Besides, long-term demographic forecasts aren’t particularly relevant for equity investors. It’s true that changes in the population have a sizable impact on GDP growth. But stock market returns are not positively correlated with economic growth. Returns from equities are a function of valuation and future returns on capital – a subject to which I will return later – rather than changes in GDP. Nor is there a positive correlation between population growth and stock market returns. In short, investors should not get too hung up on inherently unreliable long-term demographic projections for Japan. 1. It is not clear that demographic estimates are accurate over long time frames. In fact, while spurious specificity is one of the attractions of demographics as a talking point, the fact that neither death rates nor birth rates have proven predictable should caution one against accepting any assertion about demographics. 2. It is not clear that demographics are the critical variable in determining the level of economic growth. That role falls to the growth rate of TFP. 3. It is not clear that equity returns are related to absolute levels of growth. Equity returns are an issue of valuation. Nominal returns are greatly affected by inflation too. 4. It is not clear that demographic change, even if it is allowed as a negative for economic growth, is necessarily negative for stocks, as certain forms of demographic change may be associated with a rising equity market multiple. Demographic change could in fact represent a benign environment for stocks. On the first point Kinmont makes points to the irony in that the worry about Japanese demographics seems to be peaking just as Japanese fertility is on the mend. This is a cheap shot though and not one which stands up to scrutiny. First of all on the fertility trend itself I get the same chart as Kinmont's below using data from the World Bank showing a rebound in Japan from a low point of 1.29 in 2003 and 2004 to 1.37 in 2009. However, Indexmundi which takes its data from the CIA World Factbook has fertility much lower and actually declining in Japan. The latest data point from the CIA World Factbook reports an estimate of TFR in 2011 is 1.21. This is a pretty steep difference and I invite comments as to suggest the right number or at least the right trend. All this is of course underlines Kinmont's point that we don't know the future and that economists have a proven track record for abysmal forecast performance. Still, we should get our concepts right at the offset. Long term projections in age structures are likely to be robust as they are a function of people already being born and while migration may change the course of ageing in any given country the fact that we are all ageing at one at the same time means that there are fewer migrants to go around. I would then claim that ageing does matter and that understanding how an economy such as Japan adapts to the ageing of its population remains one of the most vexing and important issues for social scientists and investors alike. So when Kinmont implies that low fertility in Japan is a non-issue I have to strongly oppose. Just take a look at the chart above Kinmont himself uses. Fertility has been below replacement levels in Japan since 1970 and on current growth rates (assuming a constant growth rate of fertility which in itself is dubious to the extreme) fertility levels would reach replacement levels some time in 2030-40. So, that would be 60 years with below replacement fertility. Even if fertility in Japan (and again in most of the OECD) took a discrete jump to replacement levels it would do very little to change the outlook for ageing in the immediate future. In claiming that demographics do not matter Chancellor are Kinmont are taking a very wide brush over the general recognition in the academic literature that our economic systems tend to hit a snag once fertility falls below a certain level (a TFR of 1.5). This is also called a fertility trap and what it means is that it becomes very difficult to escape negative population dynamics once they set in. I emphasize this since it highlights that we are not, as a friend of mine likes to point, simply shooting arrows into the void when we point to the importance of these issues. I recommend the following presentation by Wolfgang Lutz et al and the paper that goes with it or this old post at AFOE by Edward if you are still not convinced. The unrevealed assumption, then, behind the mathematics used to arrive at widely-used population estimates is that the Japanese population will drop to zero. One cannot help but suggest that the logic of demographic pessimism is circular. I want to re-emphasize that the issue here is not predicting fertility and death rates but recognizing the effect that the current and past trends have on ageing today and tomorrow. Try the recent work by Wolfgang Lutz, Warren C. Sanderson, and Sergei Scherbov if you want to see the cutting edge here and while uncertainty is still a key variable ageing remains a tangible reality. The main question issue I would like to get across is then that the demographic transition manifests itself in a transition of ageing and that this essentially becomes our main unit of analysis. Growth and Demographics, No Connection? Kinmont and Chancellor argue that demographics are likely to be less important for growth over time as total factor productivity (TFP) growth tends to be the main driver of growth. Japan could quite easily grow at a good rate, especially in per capita terms, for a high-income developed country even in the face of a falling population (or more precisely a falling working age population). All that is required is for TFP growth to accelerate back to the level of growth enjoyed by Japan prior to the bursting of the Bubble in 1989. TFP slowdown preceded the population peak. Variation in TFP performance not in labour input growth is likely to be larger than the negative effects of population change. This is an important point and more importantly, Kinmont offers an argument to explain the declining labour input in Japan’s economy which links in with the fact that Japan has been stuck in deflation and at the zero lower bound for the best part of two decades (my emphasis). Labour input has in fact fallen at an accelerating pace over the past 20 years. It is clear that the fall is principally a decline in man-hours. This cannot be simply a function of a decline in the working age population because that decline only began in 2000. Instead, its origins must lie in rising unemployment and under-employment. A persuasive new paper, The Paradox of Toil, by a researcher at the NY Fed  argues that a decline in labour input is a natural consequence of a deflationary economy with zero (or effectively zero) interest rates. In short, the declining labor input in Japan is a function of deflation and being stuck at the zero lower bound. In addition, this Fed Researcher Kinmont refers to is Gauti Eggertson who studied under Krugman at Princeton and did most of his initial work on the liquidity trap and the zero lower bound. So, I would be careful getting in his way without a strong look at the argument. I think however that we might be dealing with the problem of a missing link in the sense that demographics may be one of the primary sources of deflation and the liquidity trap in the first place. This is an argument that has been pushed in Japan’s case in the sense that it was a lack of pent up demand that held Japan back in the 1990s as well as deleveraging. Indeed, Japan may hold a cautionary tale on the effects of a balance sheet recession in an economy where fertility has been below the replacement level for an extended period. The Eurozone periphery (ex Ireland) who have even ceded monetary policy to Frankfurt are case studies to this theory I think. I would also emphasize that as labour input declines so does, obviously, consumption (aggregate demand) input which again feeds into the the paradox of thrift in the closed economy (or perhaps even a realisation crisis?). In an open economy it leads to export dependency as domestic investment actvity responds to foreign demand as well as the excess income you earn from a positive net foreign asset position (if you are so lucky as to have one) becomes a crucial source of growth. Another more fundamental point is that if the total factor productivity growth (TFP) is a residual what is actually hidden in this residual? Well, I had a wack at the whole argument a while ago from the perspective of the academic armchair. 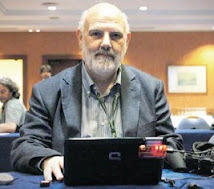 Technology and productivity are famously assumed exogenous in the Neo-Classical tradition while New Growth theory as it was developed in the 1980s and 1990s emphasised the need to specifically account for the evolution of technology. Today, I would venture the claim that there is a consensus that productivity and technology is a function of what we could call, broadly, institutional quality which encompass almost anything imaginable from basic property rights to the level of entrepreneurship. Indeed, a large part of research is still devoted to pinning down exactly which determinants that are most important here both across countries and through time. Now, I would argue that, in the context of standard growth theory, this is where the scope for the study of the effect of population dynamics is largest. Thus I don’t think it is unreasonable to expect the level and evolution of productivity growth and technological development to be a function of the current population structure but also its velocity which is a function of e.g. migration (new inputs? ), future working age size etc. Also, this is also where human capital and the evolution of technology is joined at the hip through the idea of innovative capacity and readiness. Once we venture into the notion of endogenous growth theory and thus the attempt to directly explain the sources and components of total factor productivity growth there is growing evidence that age structure/demographics alongside a host of other variables are important. Try this one for a recent literature review, and for the general link between growth and demographics the list of contributions is long. You just need to read around a bit. I would argue then that growth and prosperity of the modern capitalist welfare state is highly conditional on some form of demographic balance and Japan has long since moved beyond into unbalanced territory. Basically, Japan is stuck in a liquidity trap as well as a fertility trap. The latter works along the lines of depressing consumption demand and making it very difficult to maintain key economic structures such as e.g pension systems. In addition, ageing affect the growth path of an economy and leads to export dependency, this last point however which I concede is not yet an established fact in the literature. We seem to have two intertwined arguments here. Firstly, the extent to which demographics may have an influence on growth it is irrelevant for the investor since you can't buy GDP growth anyway. Secondly, the evidence of a correlation between demographics and equity prices is weak and indeed, if anything, should be bullish for Japan (this last point is made by Kinmont). per se to be of only small importance to stocks. It would be unwise to disagree with the gist of this point. Even if I can make a connection between demographics, growth and investor performance it is very likely that buying into such a story at too high a valuation will lead to poor returns. Buying at the right value is the most important aspect of any investment decision. The origin of Japan’s problems is falling valuation when compared with the rest of the world. When we note in addition that it is excesses of inflation or the arrival of deflation (that is, monetary phenomena reflecting policy errors) which tend to reduce market average valuations, we feel it safe to conclude that demography will have next to nothing to do with the longer-term return profile of the Japanese market either in nominal or real terms. I feel this is a very dangerous claim to make because it assumes that the deflation dynamics of Japan and indeed the problems facing the Bank of Japan in reviving credit growth are unrelated to demographics. In addition there is the unintended consequence of BOJ having to monetize an ever greater amount of JGB issuance in the future which in itself becomes more paramount as Japan ages. On the second point regarding a direct relationship between demographics and stock prices (asset prices in general if you will) I think Kinmont does better especially because he does not fall into the asset meltdown hypothesis trap. 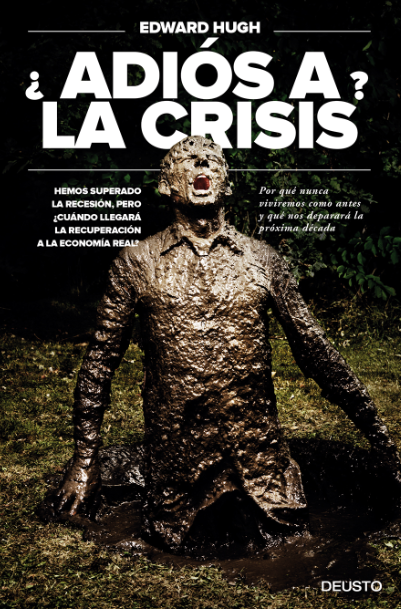 In short the asset meltdown hypothesis states, in a US context, that as the baby boomers retire they will dissave and thus need to sell off their financial assets to a market which cannot support the flow, because the generation in the working age years is smaller, and that this will lead to an "asset meltdown". Generalized, this is then the classic (and naive) nexus between life cycle economics and financial markets which postulate that dissaving into old age is rapid and imminent. There are two problems here. 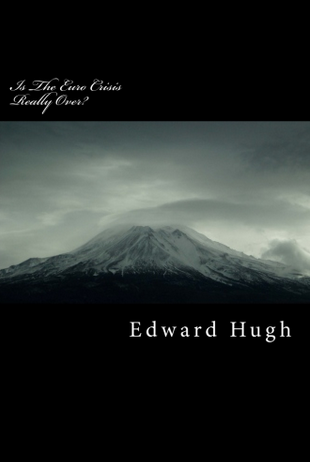 Firstly, the empirical (and indeed theoretical literature) has found it very difficult to verify that dissaving occur among elderly cohorts to the extent postulated by the standard life cycle theory. Secondly, the relationship between asset prices and broad demographic aggregates appear weak. Results differ from country to country and most studies take place in a US and Anglo-Saxon setting which tend to bias the results further. Kinmont does however point to a study by Geanakoplos, Magill and Quinzili  which show how the ratio of the 45-54 age group to the 25-34 age group is closely related to P/E ratios. As this ratio is set to increase in Japan, Kinmont ventures the idea that, if anything, perhaps you would want to buy Japan on the basis of demographics. I have read the research by Geanakoplos et al and I find it intriguing, but my problem is that it does not control for the old age dependency ratio which suggests that the key ratio will be correlated with ageing in general. But I should be hesitant disregarding it on the basis of this hunch. I am preparing a large panel data set at the moment on demographics and stock prices with the aim to essentially rejuvenate a literature which seems too focused on the asset meltdown hypothesis noted above. On a more general level, demographics and investment has been a core theme in the post crisis flow into emerging markets which, by and large, share the characteristics of being in the middle or at the end of their demographic dividend. Again, this does not nullify the importance of valuation and certainly, the recent soft patch notwithstanding, many emerging markets are still looking expensive. Where goes the DIP then? If you build your story up around the notion that investors buy value and not GDP growth you can easily come to the conclusion that demographics are irrelevant for the investor at large. This however would be a mistake. I would be the first to wish for a return to a state of affairs in which investors needed only to look at valuation and firm fundamentals to make their decisions. Today however, you need to understand the macro backdrop and in order to do that you need a firm grip on how demographics affect macroeconomics. Pointing out that we are poor at predicting birth and death rates as well as pointing to weak evidence between growth and demographics do not cut it. We need not predict fertility and mortality but instead we need to understand the effects of ageing already present and there is plenty of evidence that demographics affect the growth rate and growth path of the economy. I am more sympathetic to the strict relationship between stocks and demographics which is fickle and not well understood. Clearly, there is not presently any convincing model or framework which suggests how and why you might be able to buy sound demographics on a beta level. My main bet is that demographics should, at least, be used to qualify the notion of the global market portfolio and especially that demographics be used to re-balance such a portfolio over time. In conclusion, Kinmont and Chancellor bring up some valid and good points in their attempt to brush away demographics as an important input variable to investment and macroeconomic analysis but you shouldn't be fooled. Just as was the case with the original DIP you accept this new version at your peril. - Franco Modigliani and Merton H Miller (1958) – The Cost of Capital, Corporation Finance and the Theory of Investment, American Economic Review 48 (June 1958) pp. 261-297. - GMO White Paper - After Tohoku: Do Investors Face Another Lost Decade from Japan?, Edward Chancellor and Morgan Stanley Japan Strategy - The Irrelevance of “Demographics”?, Alexander Kinmont. I realise that I have lately been referring to sources and pieces of research which by nature of their origin (banks, research firms etc) are behind subscription walls. I am sorry, but I will make sure to produce relevant quotes so that my readers can follow the issues and arguments. I cannot upload full PDF versions of the reports for obvious reasons and I hope my readers will understand. Events in Japan and Libya do not seem to have derailed the ongoing positive sentiment in the market, but it might just have alerted various Masters of the Universe that black holes (or was that swans?) are both invisible and unpredictable until they occur. It is precisely because of this that such events are important even if I think that hedging against so-called "tail risks" by buying specially tailored financial products is probably as effective as buying an extra swim suit in anticipation of the next tsunami. While it is certain that QE2 will end, it is considerably more uncertain whether QE itself will end and it seems as if the market is implicitly expecting a continuation in the form of QE3. But it is not clear cut. The macro picture is brightening in the US and Fed officials are getting more hawkish and what was certain a few months ago, may not be so certain today. In addition, if the perception changes into an expectation of an end to QE the path and pace of the Fed's exit strategy is also uncertain. There is considerable uncertainty (and disagreement) as to the exact effect of QE in the first place and this shows itself on two fronts. One is the discussion of whether QE has been a success or not and the second is the more technical (yet equally important) question of through which channels QE can be shown to work (if at all). Krugman recently suggested the exactly the stock market effect which this post is based on. In order to get to grips with this I thought it would be apt to center my analysis on the horse's own mouth as it were and specifically the idea that the Fed is targeting stock prices. Obviously, if asked directly Bernanke and his colleagues would certainly point out that it is not all about stock prices but a much more complex issue of affecting rates on all maturities of the yield curve as well as to repair the the monetary policy transmission mechanism as well as the monetary multiplier. Yet, given chairman Bernanke's comments that the success of QE2 is linked to rising stock prices I thought it would be interesting to have a look at the macroeconomic effect of rising stock prices and thus the idea of the wealth effect. This is to say, what is the effect of rising stock prices on personal consumption expenditures and thus, in some sense, growth? The wealth effect from the stock market in the US is time variant but appear to be particularly strong in the period 1999 to 2010 which, in some sense, validates the Fed's focus on stock prices. The wealth effect also shows up in a negative relationship between changes in the SP500 and changes in the saving rate which suggest that rising asset prices may counteract deleveraging. The fiscal multiplier estimated here is also time variant and seems to change signs across periods. The marginal propensity to consume seems to have risen over time in the US. Here, the two last bullet points are secondary to the main focus of this note but still worth thinking about. At a first glance, it is difficult to see any meaningful correlation between the two, but look closer at the period from 2007 and onwards (as well as in 2001) and you will see a closer semblance. But this may also be a case of the infamous spurious correlation as stock prices and consumption are strongly correlated around recessions and thus also in the rebound. Surely, the linear fit depicted above for the full period is not statistically significant which suggests that measured over the grand sweep of time there is no meaningful correlation between changes in stock prices and changes in consumption expenditures. Importantly, this would also seem to invalidate the Fed's link between QE2 and rising stock prices since such a link is empirically dubious at best. Yet, as the graph from the period 1999 to 2010 shows the link may have strengthened. To that end I have conducted a small study fitting a linear model with the annual change in consumption expenditures as dependent variable to the change in the SP500 as well as government transfers and real disposable income to control for the marginal propensity to consume and the fiscal multiplier. I use monthly values to get 612 observations in the full sample regression (1960 -2010). Crucially, I split up the dataset in three periods; 1960-1980, 1981-1998, and 1999-2010. In the full period, the estimation gives an MPC of 0.41 , a multiplier from government transfer worth of 0.09 and from the SP500 equal to 0.027 (all significant at 1%). This implies that a 1% annual return in the SP500 yields an increase the annual change of consumption expenditures of 0.027%, but the results also indicate that the "fiscal multiplier" is about three times larger. So, not exactly convincing results to support QE as an attempt to boost consumption through the stock wealth effect. Splitting the period as noted above  does seem to add value to the analysis. For the period 1960-1980 the simple OLS estimate yields nothing and not even the estimate for the MPC is significant . In the period from 1981 to 1998 the MPC is estimated to be 0.48, the multiplier from government transfers at 0.14 and lastly for the SP500 at 0.014 although this estimate is only significant at 10%. The period from 1981 to 1998 thus return a strong fiscal multiplier (at least in terms of significance) while a weak, at best, multiplier from the SP500. In the final period however, something interesting happens. The MPC increases to 0.58 which squares well with the declining saving rate in the same period. More interestlingly however, the estimate for the fiscal multiplier changes signs while remaining significant at 1%. The estimate suggests that a 1% increase in government transfers will yield a -0.36% decrease in consumption expenditures. Surely, proponents of Ricardian Equivalence would be interested in testing more thoroughly for the validity of this estimate. Meanwhile, the estimate for the wealth effect from stocks is estimated at 0.035 and significant at 1% (and thus quite close to the wealth effect estimated in the full period). Finally, and focusing on the period 1999-2010, I also fitted a linear model with the savings rate as dependent variable. The rationale here would be that the wealth effect from the stock market should materialise in a negative relationship and thus that a rising stock market would counteract deleveraging. Not surprisingly the coefficients for both changes in income and changes in government transfer are positive which suggests that higher income and transfers from the government leads to higher savings (that Ricardian Equivalence again?). The coefficient estimated for the SP500 is negative and much higher than the wealth effect to consumption. All estimates are significant at 1%. As my readers would no doubt remind I have added nothing to the debate of whether QE affects stock prices in the first place and then has an effect on the real economy through the wealth effect. I have taken this as given on particular notice of Bernanke's explicit comments on the success of QE2 in relation to a rising stock market. As it turns out, the story is a bit more complicated than that. I am pushing back against the view that QE – particularly the large-scale asset purchases – directly drives risk assets. The reason I am skeptical is that no one has to my satisfaction explained how – sentiment aside – QE has had a material effect on the demand for, or funding of, risk assets. It’s not even straightforward to isolate the effect of QE on the assets that the Fed purchased. As I see it, QE2 was a $600bn placebo. If enough investors think it was good for risk assets, then perhaps it was good for risk assets. Stopping the placebo may have an effect, but my sense is the macro will remain the key driver of risk assets. The first part of Minack's objection to the QE-Risk Asset synthesis is important and I have also found it difficult to replicate the idea that QE directly drives risky assets . But the link need not be that specific for the end of QE to have an adverse effect of the growth narrative. I think the underlying reason as to why the market may now be driven by the improving macro picture is exactly because QE is seen as an integral part of that improvement. It then stands to reason that if and when QE ends (without extension) it will have an impact. Another point relates to the idea that the commitment itself to QE is paramount and thus that the largest effect of QE is back loaded around the announcement . I think it is an accurate way to frame the effect of QE but this also implies that a second layer of expectations may take hold in the form of the expectation of the announcement. In reality, it is difficult to see how many of these "announcements" the market has discounted I think. An altogether more heavy analysis recently came from CSLA's Russel Napier simply noting that investors ought to sell US equities on the failure of QE2. Napier particularly makes the point that QE2 has materially failed to induce banks to increase credit. Broad money has contracted since the launch of QEII in November 2010 and this suggests that rising growth and inflation are not likely. QEII is boosting unused bank reserves, but banks continue to shrink credit and it is having no direct positive economic impact beyond depressing Treasury yields. Equity-market valuations are close to bubble levels and need the prospect of higher inflation and negative real rates to continue higher: but M3 is contracting. The failure of QEII will undermine investor faith in a monetary solution. With equities near bubble valuations, based on cyclically adjusted PE, a failure to reflate risks major downside. The Fed will try again with a new package, but investors would do best by waiting to see how it plays out. This analysis then suggests a much more imminent and substantial effect of the alleged failure of QE2 and thus also the effect of a non-committal to QE3. Clearly, we are now in the situation where this illusive concept of the monetary transmission mechanism becomes important. Thus, has QE2 succeeded because it has helped equity prices to rally or has it been a failure because of its inability to induce more than an increase in excess reserves? My intent is not to argue strongly that the economy cannot continue to expand as fiscal and monetary stimulus comes off, but instead to at least ask why this should be expected as a foregone conclusion. On the basis of leading indices of economic activity, we observe more indications of economic slowing worldwide than we observe growth. Moreover, strong periods of employment growth have historically been preceded by high, not low, real interest rates. This is far from a perfect relationship, but it is clear that historically, high real interest rates are far more indicative of strong demand for credit, new investment, and new employment than low real interest rates are. I would file this under "I'd wish I said that". The big question then remains as to what kind of momentum the economy and risky assets will retain once stimulus comes off. To summarize, I have been critical of the Fed's decision to tie its policies so close to the movements of the stock market and I still am. The idea to implicitly target stock prices is the ultimate form of hubris that a central banker can commit since it plays into the notion that the central bank can consistently fine tune financial markets. It can't. However, my analysis above gives some support to the idea that QE works, and works well, through its effect on stock prices. At least, I would note that the extent to which e.g. Krugman is right the apparent change in the wealth effect over time gives some credence to Bernanke's comments in 60 minutes even if I don't agree with the Fed's strategy on this point. * The data used for my estimations are monthly data from the St. Louis Fed's database. - Clearly this is below traditional Keynesian estimates but remember that we have monthly data in changes and thus likely to have stationary time series (i.e. we have detrended series! ).To be rigorous one would obviously have to properly test the unit root properties of the series in question. - I am considering writing this up as a small paper trying to quantify the structural breaks in the data as well as to fit a non-linear model. - Which points to the notion developed exactly by researchers (Friedman for one) using data for that period that consumers spend out of permanent income and not current income. - I believe Goldman Sachs made a top notch study on this. Evidence which would enable us to assess the full economic impact of the Japanese earthquake and tsunami is still hard to come by. There is a lot of talk of supply chain disruptions, but little in the way of detailed evidence to back up assertions of the more anecdotal kind. Even the latest set of manufacturing PMI data has decidedly left the jury out on the topic. 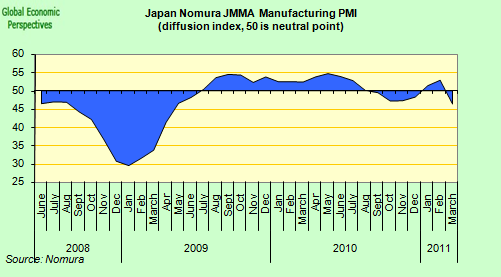 Evidently in Japan there was a clear and substantial drop in activity, but that was only to be expected . The Japanese March PMI slumped to a two-year low of 46.4, down from February’s reading of 52.9, the largest one month drop on record. 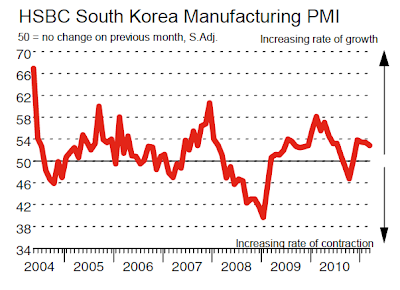 “March PMI data provide the first indication of how output at small, medium and large sized Japanese manufacturers was affected by the events following the Tohoku earthquake on 11 March. 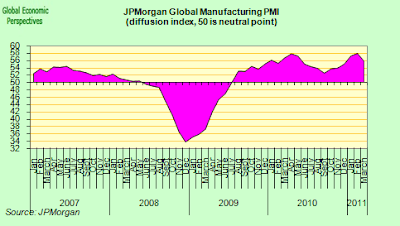 The PMI slumped to a two-year low, suffering the largest monthly fall in points terms since the survey began in 2001, exceeding the drops seen after 9/11 and the collapse of Lehmans. The latest index reading is consistent with a decline in Japanese industrial production of around 7.0% on a 3m/3m basis". Any analysis of Japan's position vis-à-vis the rest of the world needs to start with the question of whether Japan was running a trade surplus or deficit. A trade deficit implies the world has lost a customer: ie, demand: whereas a surplus would mean the world has lost a producer, namely, a supplier of products and intermediate goods. Inasmuch as Japan boasts the world's third-largest trade surplus after China and Germany, I think the world has lost an important supplier. Supplier countries' products are typically in demand for one of two reasons: either they are cheap or they are essential. A key to distinguishing between the two is the exchange rate. When a nation's currency is cheap relative to those of its trading partners, its exports tend to fall into the first ("cheap") category, whereas exports from countries with a fully or over-valued currency tend to fall into the second ("essential") group. The Japanese yen has been the strongest currency in the developed world since the Lehman-inspired financial shock. Its strength was reaffirmed when it surged into the Y76-77 range against the US dollar in the wake of the earthquake. Japan has continued to run one of the world's largest trade surpluses in spite of an extremely strong currency. Inasmuch as this is evidence that there are many businesses around the world that must buy Japanese products regardless of the cost, I suspect that many of Japan's exports cannot be easily substituted. But elsewhere, at least on the surface, there was little sign that companies were being held back by any substantial shortage of components. Digging a little deeper, while manufacturing output strength weakened slightly from February, survey respondents still indicated companies were raising output rapidly. On the other hand it is hard to sort the wood from the trees here, since global output could weaken for any of a number of reasons, most of them nothing whatsoever to do with Japan. 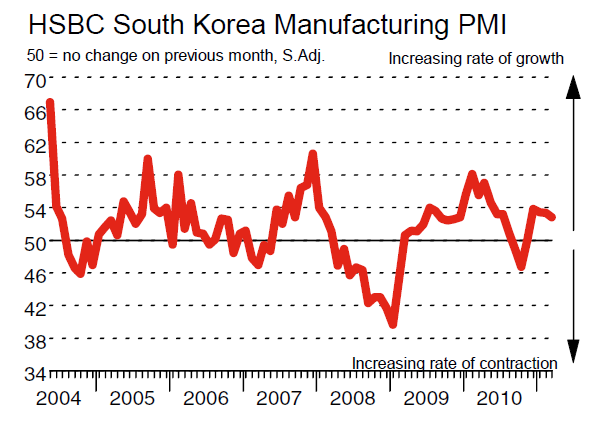 More significantly, manufacturing activity did slow in South Korea, and failed to really recover in China following the end of the new year holiday season. These two countries are among the most closely integrated with the Japanese economy. On the other hand, there has been plenty of earlier evidence that the Chinese economy may now be slowing somewhat, and this for its own domestic reasons. So it is hard to know what is attributable to a Japan impact here, and what isn't. Certainly it does seem that economies in Asia are now slowing somewhat, and since the region has been one of the main drivers of the global economy, then this slowing will be noticed in those economies which are most dependent on exports. 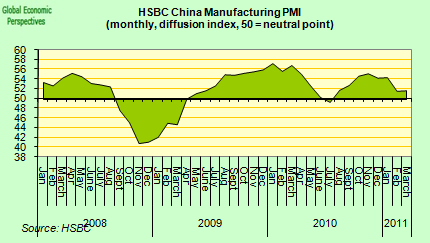 Curiously, both in Europe and in China the final PMI reading was below the initial flash estimate, which could suggest that problems mounted a bit as the month advanced, with those responses which came in later being slightly less optimistic. Either way, the big issue isn't the supply chain disruption one - since lost output can (in general) be quickly recovered in this context, especially given the degree of surplus capacity which still exists in the global manufacturing system - rather the question is one of where exactly we are in the current global cycle? Many Emerging market economies have plenty of scope for continuing rapid expansion, as long as the markets are still willing to fund them. And risk sentiment doesn't seem to be an issue at the moment, although forthcoming monetary policy decisions at central banks in both the developed and the developing world make the mid term outlook rather more uncertain than it was six months ago. 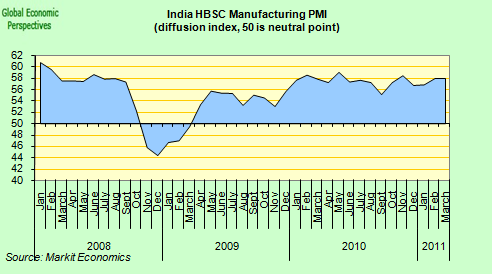 "The momentum in India's manufacturing sector held up well in March, suggesting that growth is not an immediate concern. Output growth kept up the pace and the inflow of new orders accelerated, holding promise of a continued strong momentum in output in the months ahead. However, capacity constraints are tight as reflected in the increase in the backlog of works. Also, manufacturer's are facing ever steeper increases in input costs due to tight labour markets and rising material costs, which are increasingly being passed on to output prices. In turn, this calls for further tightening of monetary policy to tame inflation pressures." 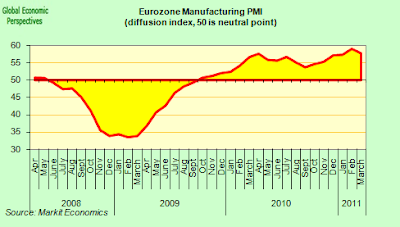 In the Eurozone,where the headline PMI slipped from 59 in February to 57.5, the results followed a now familiar pattern, with Germany, France and Italy all showing quite robust expansions, while Greece, Spain and Ireland continue to struggle, even if in each case the performance was an improvement on earlier months. 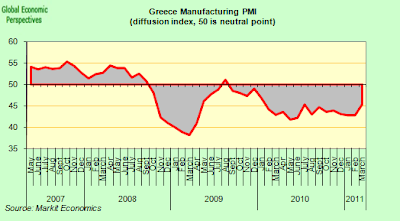 Of the three, only Greece continued to show a contraction in activity, even if this was at a slower rate than previously. 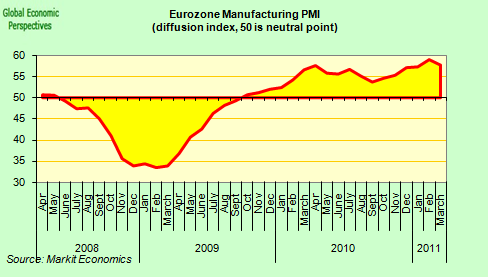 “The Eurozone’s manufacturers continued to report buoyant business conditions in March. 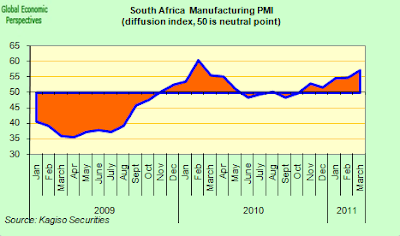 Despite the slight easing since February, the data are consistent with industrial production growing at a quarterly rate of 2%, spearheading the region’s recovery. 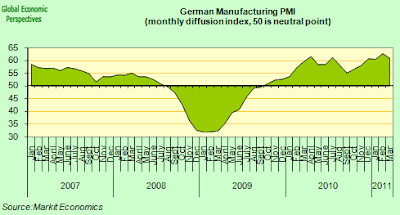 “National divergences are marked, however, with surging output growth driving record job creation in Germany, while weak or falling production led to ongoing job losses in Spain and Greece. “German manufacturing growth cooled during March, but the latest figures confirm an exceptionally strong performance for the sector across Q1 2011 as a whole. Firms continued to benefit from steep gains in inflows of new business during March, helped by the fastest expansion of export orders for ten months. “The survey’s fifteen-year anniversary was marked by a series record rise in manufacturing employment levels, as firms continued to step up production capacity in response to steep improvements in order books. “March data indicated higher levels of purchasing and stocks of inputs, reflecting concerns about lengthening supplier delivery times as well as greater production requirements. Strong global demand for raw materials was cited as the primary reason for supply chain delays, and only a small proportion of the survey panel cited the earthquake in Japan. 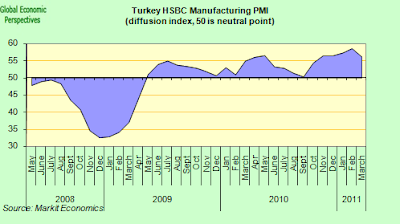 “The latest PMI survey indicated a continuing divergence between demand in domestic and foreign markets, with the latter proving the main source of new order growth. Meanwhile, a record rise in output prices was recorded, although the rate of charge inflation remains much weaker than that seen for input costs as firms struggle to fully pass on price rises to clients. 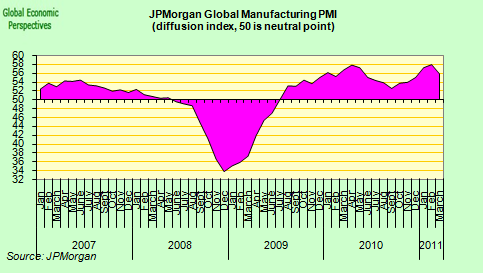 But the issue this raises is that the global economy must now be getting somewhere near the peak of this cycle, at least in terms of manufacturing activity. 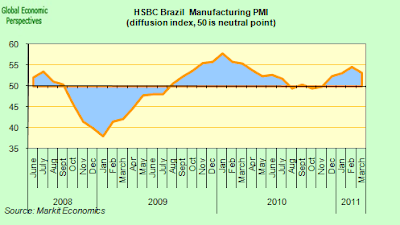 Central banks across the globe are moving into tightening mode, and much of the low lying fruit has now been eaten, so the issue for the fragile economies on Europe's periphery (who are now totally dependent on movements in demand elsewhere for growth) is how they will fare, not during the highpoint, but as and when the current expansion slows. In the US, the PMI index, compiled by the Institute for Supply Management, edged down from 61.4 in February to 61.2 in March, but stood at a level close to a 27-year high. 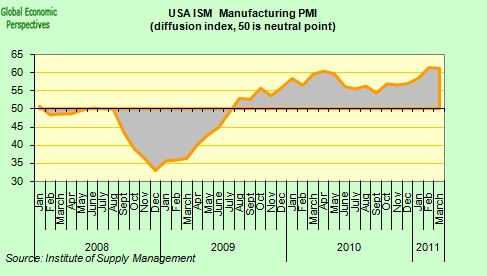 US ISM manufacturing declined from 61.4 to 61.2 in March. This was marginally higher than consensus expectations of 61.0 and our estimate of 60.7. 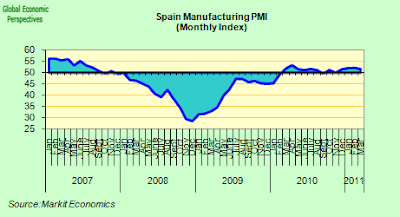 However, details of the eport suggest that the ISM will continue lower over the coming months. New orders dropped to 63.3 from 68.0 and although inventories declined as well, the drop was more modest. This means that the two order-inventory differentials declined further and continue to signal a downward correction in the ISM index. The ‘new orderscustomer inventory’ differential, which has proven the most reliable on short-term movements, suggests the ISM should decline to around 57. The ‘new orders-inventory’ differential suggests a more pronounced slowdown to 56. New export orders weakened to 56.0 from 62.5 possibly reflecting the slowdown in Asian growth while supplier deliveries increased to 63.1 from 59.4, indicating a slower pace of deliveries. Prices paid rose further to 85.0 from 82.0 reflecting the increase in commodity prices and upward pressure on input prices. 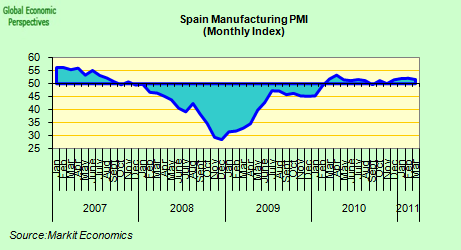 That said, even a moderate decline from the current level would still leave the ISM index at a healthy level. 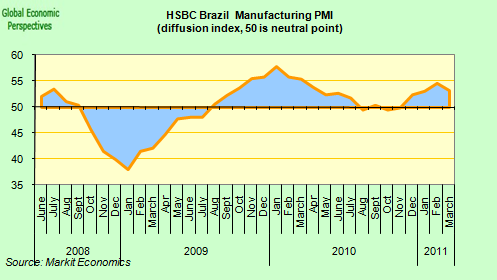 Globally, the headline PMI reading was 55.8, well above the historical average and the level of 50 that attempts to separate expansion from contraction, But down from the 57.4 registered in February, largely as a result of the slump in activity in Japan. The main concern expressed by the authors in their monthly report referred to the inflationary threat coming from a rapid rise in the prices of inputs and evidence that manufacturers were passing these on. Certainly, in this sense, the report will do little to deter decision makers at the ECB from raising interest rates when they meet on Thursday.